Have you read Sivakamiyin Sabatham by Kalki?, if not and if you can read Tamil, you can read the whole novel here. Sivakamiyin Sabatham is a historical fiction by Kalki, written in 1944, for over a period of 12 years, in four parts and 209 chapters. It truly is a master piece and one of the main reasons I want my kids to learn how to read Tamil, it is for them to read Kalki’s work in its original form. No, this is not a review of Sivakamiyin Sabatham. But there is a point behind this digression. The one line story is, ‘The Pallava prince avenges the Chalukya king who kidnapped his love, the dancer Sivakami.’ How did the Chalukya king manage to kidnap Sivakami, the Pallava prince’s lover, in the middle of a siege with the whole Pallava army watching? The answer to this is, Sivakami’s father - a gifted sculptor sneaks out of the Kanchi fort, with his daughter and willingly takes refuge with the Chalukya king because he is tricked in to believing that the Chalukya kings knows the secret of the permanent natural dyes used to create the Ajantha paintings! So great is the imaginary character’s desire to find out how the natural dyes were created in the 2nd century BC, that he walked out on his benefactor, in to enemy camp and thus offsetting a series of events in Kalki’s imagination! The novel leaves the reader wondering, how did so many colors exist in India? How were they created? How were the primary colors extracted? Were the vegetable dyes treated specially for them to last through the centuries? If the dye pigments were extracted from the flora unique to a specific region, how were the same primary colors extracted through out the country? Was the knowledge about the dyes the extraction process freely shared or was it kept under lock and key? These are the questions explored in Muriel Kakani’s, The Mystery Of Blue. The story is narrated by little Kunku from the village of Ilkal. Kunku’s father and mother are dyers and weavers like the thousand other people in their village. As Kunku describes how her mother makes different colors from one pigment, one cannot help but wonder the scientific process behind dye making! Also one is filled with awe how the people in old times lived with a deep understanding of nature and the numerous experiments they had to go through to isolate the pigments. Kunku’s world is filled with orange, red, maroon, purple and pink. 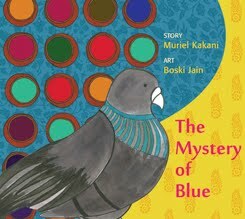 One day, Kunku, inspired by the blue shade on her pet pigeon Chandrakali’s neck embarks on the journey of making blue. See how nicely the author touches on the possibility that the artisans were influenced by the colors they see in nature?! How Kunku and Chandrakali manage to make blue is the rest of the story. The illustrations are rich and captures the essence of the story. As the story proceeds the warm earthen tones give way to the cool blue, stately indigo, royal purple and soothes the eye. The block print patterns are gorgeous. We have owned this book for two weeks, but I have read it as a bed time story multiple times. The children are enjoying the beautiful illustrations and are learning how the ancient Indians worked scientifically and in unison with nature. I am not complaining. Lovely. I loved the reference to Kalki's tale too- how much of wonderful regional literature is missed because we do not know the language? BTW, do you know that 'kunku' in marathi means the vermilion that is put by Indian women on their foreheads? Not the bindi that is stuck these days. The real powder vermilion- made by the reaction of 'haldi' or turmeric with slaked lime. Not to be confused with the 'sindoor' put in the hair-parting by north-Indians, which is originally a lead compound. lovely review. Need to pick it up soon. @Sandhya: Kunku is a Marathi word?! I did not know that. @Satish: Beautiful book Satish, well thought out. Wow. Picking this one up first thing tomorrow! Hopefully I can outwit our local Landmark guys - they are experts at hiding all Tulika books (as S will agree). And Kunku means vermillion in Gujarati too S.
I love Muriel Kakani's Ecological series writing and so nice to hear that Tulika has brought out a book with her ! Very interesting topic indeed. Thanks, UTBT for this lovely review of her new book. Clearly a very intriguing topic! Will check it out. I'd reviewed her books on the environment one time on ST. And she home-schools? Wow, am always in absolute awe of folks who do that! 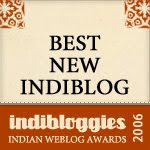 @Chox: Yes, you reviewed her DESERT CONTEST, sadly out of stock in Flipkart. Must check out Landmark or other local book shops for this book. @Ranjani: Yes, I loved her perspective. Am in the look out for other books in the ecological series.